You are at:Home»Onboard»Entertainment»What Happens on Cruise Ships at Christmas? For those who love to indulge in a traditional Christmas dinner, cruise ships won’t disappoint. Expect a table overflowing with succulent roast turkey, golden roast potatoes, juicy cranberry sauce and all the trimmings. Each line has a different approach. For example, Azamara has opted for buffet style service, while Carnival Cruises will be serving up an a la carte Christmas menu. If you’re a vegetarian or have any special dietary requirements, cruise lines will be more than happy to cater for your needs – just be sure to let them know well in advance. And the best thing? Everything is served to you by attentive wait staff which means zero Christmas day washing up. Bonus! Forget carol recitals at your local church. Christmas cruisers enjoy access to world-class entertainment with a special festive theme. There are plenty of Christmas stage shows to feast your eyes on while many lines also offer festive arts and crafts sessions, seasonal cooking workshops, talent shows, Christmas movie screenings, activities, and deck parties. We love Azamara’s offerings which include the option of signing up for a seasonal cooking demonstration which looks at mastering sugar work and marzipan models. Yum! For those wanting to upkeep Christmas traditions, lines such as Crystal Cruises have pencilled in tree lighting ceremonies, religious services and gala dinners. Disney Cruises is a great line to choose if you’re cruising with kids – they offer a huge selection of Christmas themed shows to get you and your little ones in the mood. Carnival Cruises have catered for pint-sized cruisers and enlisted an at-sea Santa to make special visits to all of its kids clubs. Celebrity Cruises will be showering all passengers aged 3-17 with a special Christmas gift from St Nick himself. Other kid-friendly festive activities include face painting, cookie decorating and special Christmas parties just for the youngsters. Like any good Christmas host, cruise ship lines go all out when it comes to decking the halls with holiday decorations. 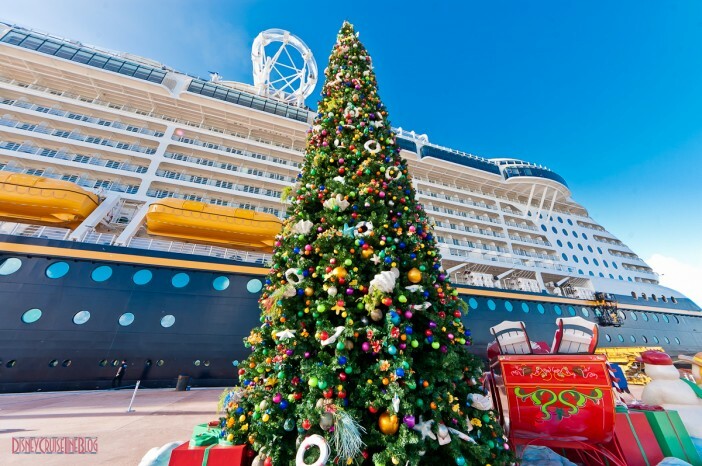 There will usually be a full-scale Christmas tree in the central public dining area or lobby, as well as an abundance of other ornaments and embellishments scattered throughout the ship. When you sail with Costa Cruises even the staff sport Christmas-themed attire. Sometimes it’s the little things that make you feel like Christmas has arrived. Carnival will give guests the option of cranking Christmas music inside their cabins, Azamara will be providing complimentary Christmas cookies throughout the voyage, Norwegian Cruises have some fabulous Christmas cocktails available, while Princess Cruises has even secured a snow machine to turn its atrium into a winter wonderland. If you’re looking for a Christmas to remember, spending December 25th on the high seas is guaranteed to delight. For incredible deals on all of the mentioned lines Cruise 1st is the go-to site and is committed to offering customers the best festive cruise deals on the market. Alternatively, give our friendly sales team a call on 0808 274 6777. Merry Christmas and happy cruising!